One of our favorite pastimes to do here at Blair Candy is try new recipes using surprising candy. Since Valentine’s Day is right around the corner, we decided to find some unique recipes using the Valentine’s Day favorite, Necco Sweethearts! Sweethearts have been around for decades, so it’s no surprise that people have found new and tasty ways to use this lovely treat! Take a look at these delicious recipes from some of our favorite blogs! 1. Rim two martini glasses with pink sanding sugar. 2. Mix the vodka, schnapps and pineapple juice in a shaker with two or three ice cubes and pour through a strainer into the rimmed glasses. Garnish with cherries and hearts. Oh, that sounds so sad. Place some conversation hearts in a Ziploc and smash with the hammer or mallet. Best to do this over a cutting board or dish towel so you don’t destroy the counter. Sprinkle a layer of crushed hearts on the bottom of each heart in the tray. Add some chocolate chips or candy melts to the disposable decorating bag. Fold over the top so they don’t fall out of the bag. Don’t fill the bag too much, use about 1/2 cup of chips or whatever fits comfortably in the bag. Microwave at 50 percent power for a minute and a half. Massage the chips and keep microwaving at 30, then 20 second intervals just until the chips are melted. Snip the tip of the decorating bag and pipe the melted chocolate on top of the crushed hearts to fill the tray. Pick up both ends of the tray and gently stamp it flat on the counter to tamp down the chocolate. Let set well, a couple hours. Pop out of the tray and that’s it! Heat butter in a large saucepan over medium-high heat. Once melted, add in large marshmallows. Heat until mixture is fully melted, stirring constantly, about 5-6 minutes. Pour the cereal, mini-marshmallows and sprinkles in a large mixing bowl. Pour the melted marshmallow mixture over the Rice Krispies and stir to combine. Add additional sprinkles if you’d like. Using your hands, press the mixture into a large 9 x 13-inch glass-baking pan. Push it down with your hands to smooth out lumps. While the mixture is still warm, press in conversation hearts all over the Rice Krispies. Chill Rice Krispies for about an hour. Once chilled, stamp out hearts with heart-shaped cookie cutters. Drizzle hearts with white chocolate and enjoy! Every Valentine’s Day, there are a few things everyone expects to receive: flowers, a card, and Conversation Hearts from Necco! 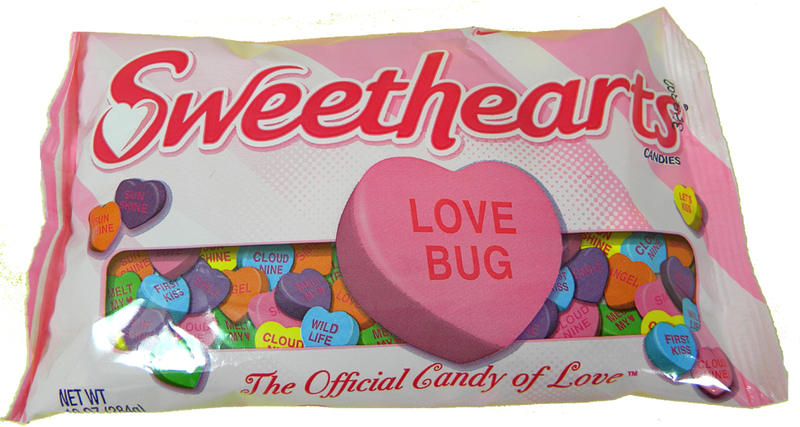 Also known as Sweethearts, Conversation Hearts are the wildly popular candies that are perfect for expressing how you feel in sweet little bite-size treats. Why? Each heart has a small message of love printed on the front, making them adorable delights for your own “sweetheart.” Even though everyone is familiar with Conversation Hearts, not everyone knows the story behind them. Believe us; the history is just as charming as the candy itself! A man named Oliver R. Chase invented a special machine, designed to cut wafer candy into different shapes, in 1847, and soon opened up a factory to produce mass quantities of this novelty candy. In 1866, Oliver’s brother, Daniel, had the idea to print cheeky sayings on the candy. Since the candy grew in popularity for weddings, the sayings included: “Married in White, you have chosen right” and “Married in Pink, he will take a drink.” This type of candy only became more ubiquitous in weddings, and it eventually evolved into the heart-shaped candy we all know and love. 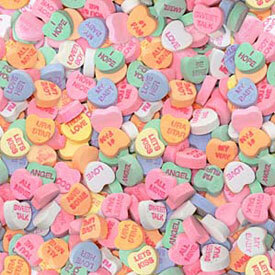 What’s really interesting is the fact that the Chase Brothers didn’t just make candy hearts. In the early days of their candy production business, they produced lozenges, horseshoes, watches, baseballs…even postcard candy! Even though they were originally pastel candy hearts, they have since changed their recipe, making them easier to chew and much more vibrant. These aren’t the only changes that have been made to Conversation Hearts. In the 1990s, Necco, the company that now owns the hearts, wanted to update some of the sayings and retire some of the dated ones. Necco accepts suggestions each year for new sayings, a tradition that continues to this day.